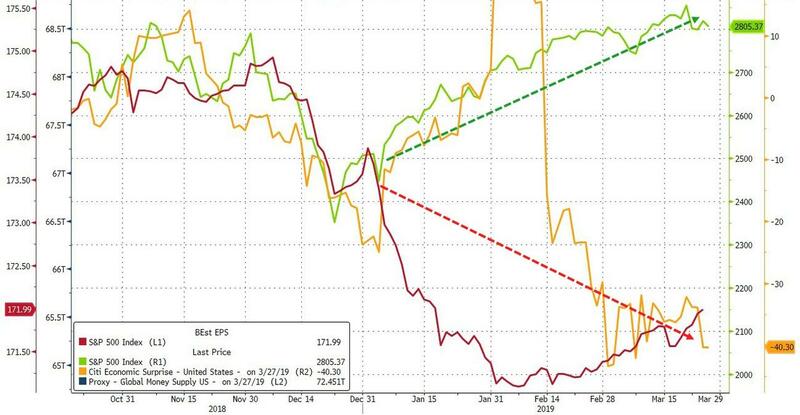 The US stock market has soared back from its December 'Mnuchin Massacre' lows, floating higher, blissfully ignoring the collapse in earnings expectations and macro-economic data. 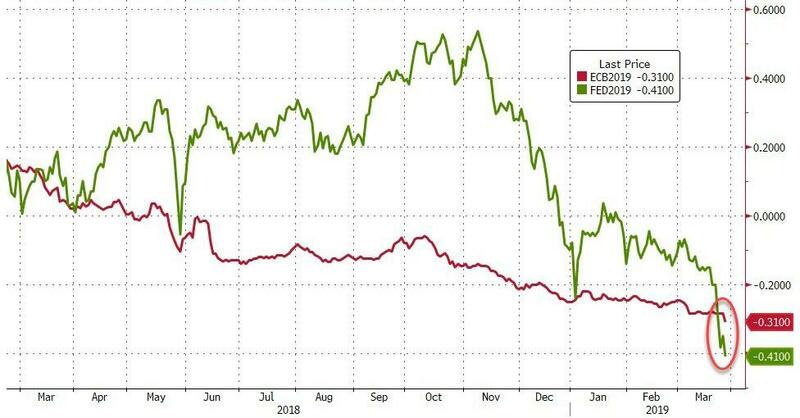 The enabler of that blissful ignorance is simple - same as it has been for a decade - an ever-increasing hope that The Fed stands ready to do 'whatever it takes' to maintain the wealth (and inequality) driver of the new normal and the only policy prescription there is - the US stock market. 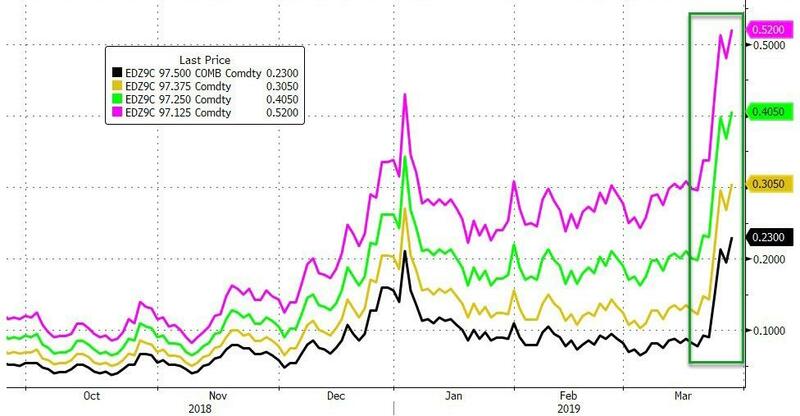 However, the market has seemingly got a little over its skis in recent weeks as it has priced in over 40bps of rate-cuts in 2019 - while The Fed just told the market to expect no rate-changes in 2019. 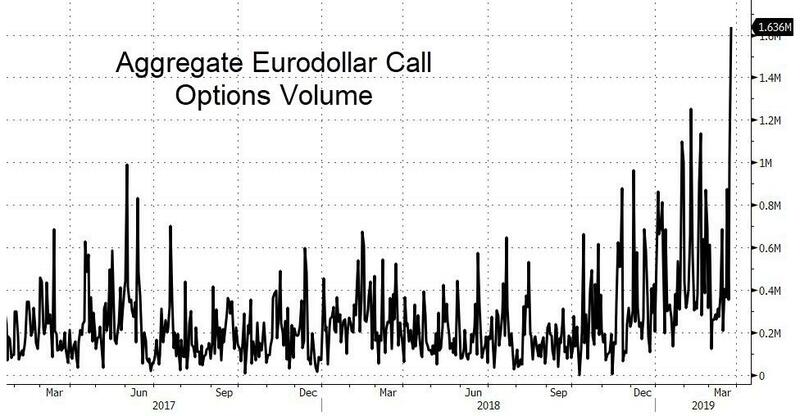 Eurodollar options volume this week has been dramatic and as Bloomberg notes, the 'eurodollar whale' position accounted for over half an average trading day's options volume on its own. Should the bet prove right, it would also likely have negative implications for a stock market drunk of Powell-Put kool-aid, and if today's 5-year note auction (not well received) is anything to go by, perhaps - as usual - the market has run too far too fast in favor of the Powell-pivot (unless of course, things are so bad economically that The Fed is forced to move so aggressively).